NEW - World´s smallest PoE thermometer - P8610! 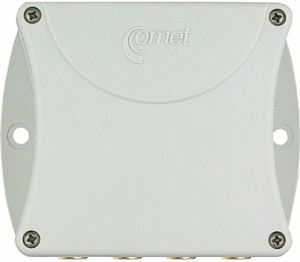 Also known as: industrial Ethernet, server environment monitoring, computer room monitor, data center thermometer, PoE temperature IP sensor, computer room temperature alert. Online Ethernet thermometer is designed for online temperature measurement and measurement from up to four external temperature cable probes. Measurement in degrees Celsius and degrees Fahrenheit supported. Online Ethernet thermometer is built in a durable plastic case. Also models with PoE - Power over Ethernet feature. 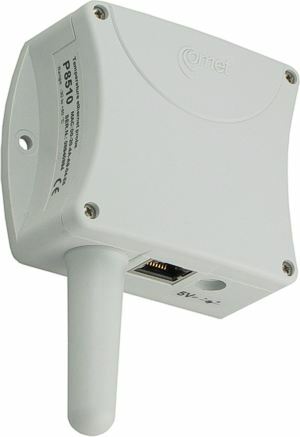 P8610 - World´s smallest PoE thermometer! 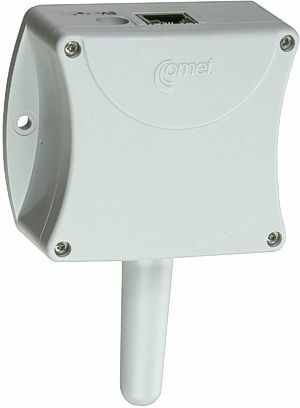 Easy creation of online data acquisition system from Ethernet thermometers by using new low cost database software Comet DBS Sensor Monitor - see also Accessories. Modbus TCP: Modbus TCP protocol enables to read measured values. Telnet: Port 9999 enables to set alarm limits (lower, upper limits, hysteresis for temperature and time delay), e-mail addresses, SNMP addresses, probe description, refresh of www pages (10s to 65535s), set storing interval to history (10s to 65535s), enable each communication channel. Capacity of the history memory is 600 values. Password protection of this port is enabled. Automatic IP address assignment from DHCP server is also enabled. WWW pages: User selectable design of www pages enabling to display curve of measurement history. User can design the look of www pages and temperature history. 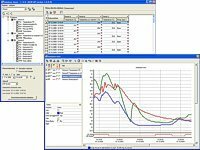 Online thermometer enables to monitor measured values. In case of exceeding of adjusted limits warning message can be sent to specified addresses. E-mail: In case of alarm creation warning e-mail message is sent to addresses defined by the user (maximum three addresses) or via e-mail to SMS message. 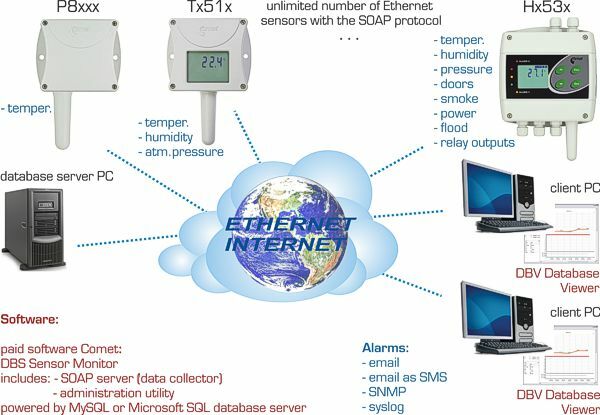 SNMP: In case of exceeding of adjusted temperature limits alarm is activated and warning trap is sent to user specified IP addresses (maximum 3 addresses). WWW pages: In case of exceeding of adjusted temperature limits active alarm is displayed on www page. syslog: Online thermometer enables to send text messages to selected syslog server after different events appear. Synchronizing of time and record to www table and temperature history is enabled by SNTP via Internet. voltage from 36V to 57V DC. P85xx power: 5Vdc, maximum consumption 250mA. TSensor - freeware for online configuring of the transmitter is ready to download. 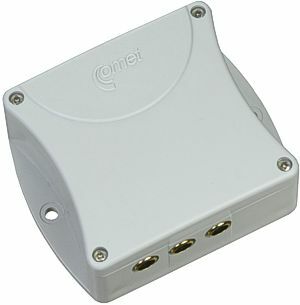 TIRS.NET - transmitters are also directly supported by program TIRS.NET from Coral s.r.o. company. Please download demo enabling full work with transmitters. Advanced Host Monitor, ControlWeb, EasyView. For record of values to graphs via web interface, project Cacti www.cacti.net is available. 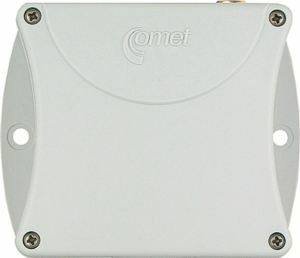 DBS Database program DBS Sensor Monitor for online data acquisition and analysis from Comet sensors. It contains all necessary components for monitoring of sensors, including one licence of DBV Database Viewer. 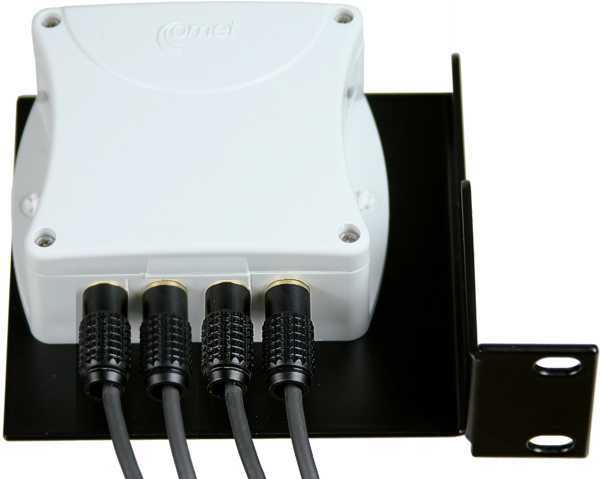 More information on online data acquisition. 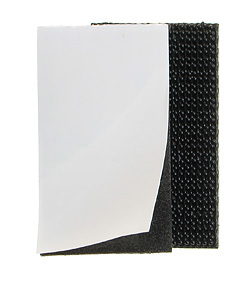 -40 to +80°C with digital sensor Dallas DS18B20 with the Cinch connector for thermometers P8631, P85x1. Watertight IP67. With PVC cable of specified length. Diameter 10mm, length 25mm. Cable lengths 1,2,5 or 10 meters available. Specify required cable length please. 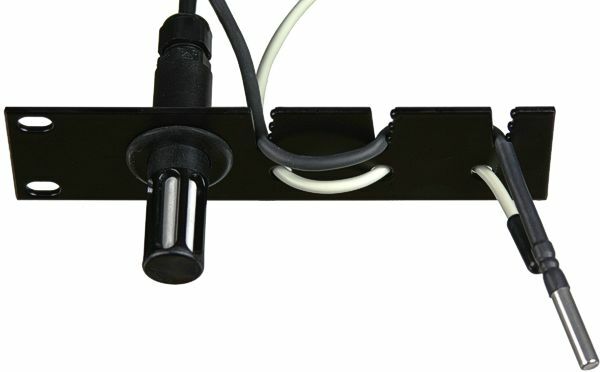 MP046 universal holder for P8xxx, Tx51x transmitters for easy mounting to rack 19"
MP047 universal holder for probes for easy mounting to rack 19"
A1825 Ac/dc adapter 230V-50Hz/5Vdc. If not using PoE - Power over Ethernet function. 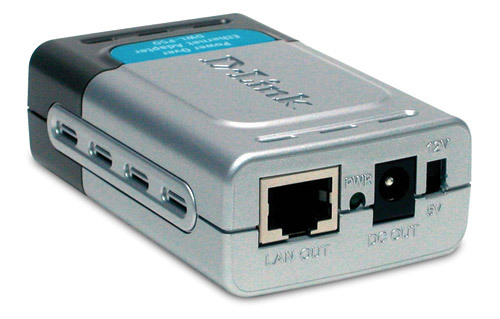 DWLP50 DWL-P50 Power over Ethernet (PoE) adapter from company D-Link. The adapter is supposed to be connected to Ethernet switch supporting PoE. Only for models P85xx without PoE function.